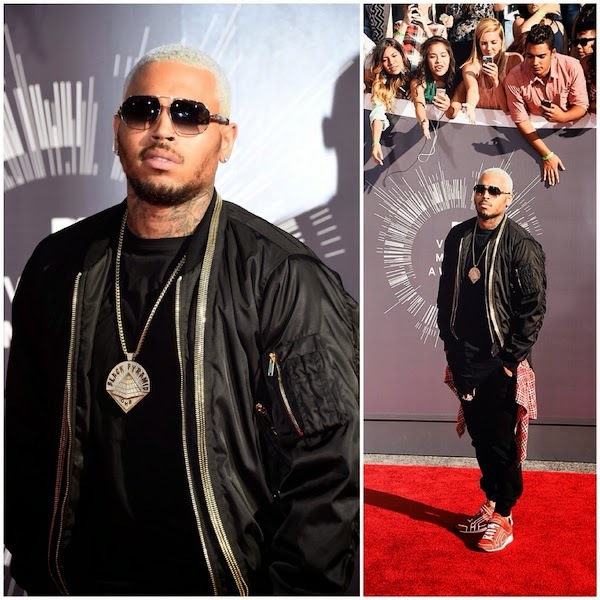 Chris Brown attended the 2014 MTV Video Music Awards at The Forum on 24th August 2014 in Inglewood, California. Chris Brown wore a multi zip trim detail bomber jacket from Alexander McQueen Fall Winter 2014. Chris Brown: the singer with the bleached blond hair resembling Amber Rose, the artiste who was recently released from jail and survived a nightclub shooting barely 24 hours earlier. I don't know this man and I can only go with what is reported from the tabloids, just why are there people / fans still clamouring for him? The dark and gothic Fall Winter 2014 Alexander McQueen collection is one of my favourites this season, with the beautiful multi gold tone zip detailing adorning many pieces. It is really a case of beautiful jacket on the wrong person. Doing a Leto with the plaid shirt around the waist with the matching Pierre Hardy sneakers ain't going to sway my opinion though.